For this Kuthiraivali Idli, I followed the ratio of 3:1 i.e., for 3 cups of Kuthiraivali Rice, I used 1 cup of whole urad dal (black gram). If you do not prefer whole black gram, you can use regular white urad dal. But trust me, you wouldn't find much change in the taste except for the colour and also it is more healthy. The only small hitch I found is that while grinding the urad dal the skins were stuck to the back of the grinder wiper(white one). What can be done is that, in regular intervals you can just scrape them back to the batter and continue with grinding or later discard it. But I just added them back to the batter, It was giving a marbling effect to the batter slightly. Again, this did not bring in any taste difference. Also I did not add any poha or normal rice to this. But added a teaspoon of fenugreek seeds. Kuthiraivali idli, Barnyard millet idli - How to make millet idlis? 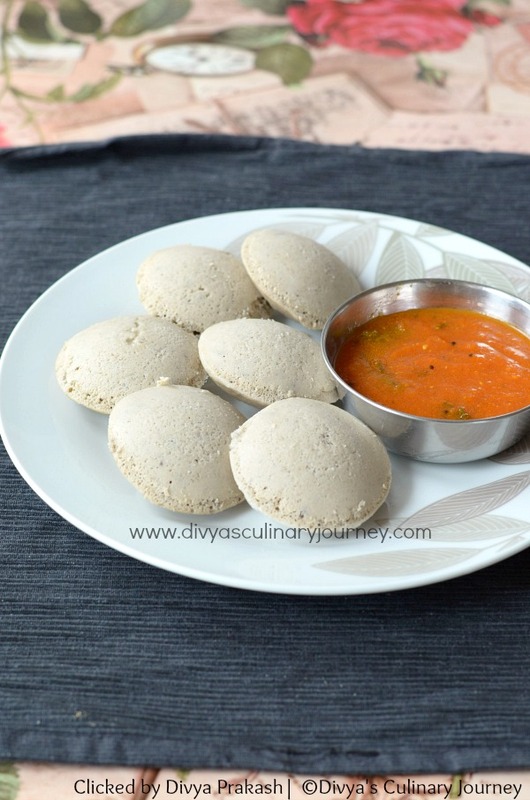 Let us now see how to make soft Kuthiraivali idlis. 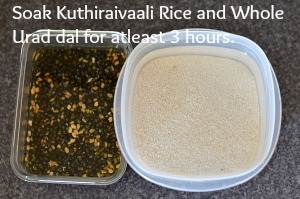 Soak kuthiraivali rice and urad dal for atleast 3 - 4 hours. First in grinder add urad dal and grind till the batter is smooth and fluffy. Transfer it to a container. It took about 30 minutes. Now add the soaked kuthiraivali rice and then grind till the batter is smooth. Take care while adding water, the batter will become runny. This took another 30 minutes. Add this to the urad dal batter along with salt and using hands mix them well and let it ferment for minimum 10 - 12 hours. The idli batter must have raised well almost doubled. Then the idli batter is ready. Now prepare the idli plate by applying oil. Then pour a ladle of batter into the idli plate such that it is about 80% full. 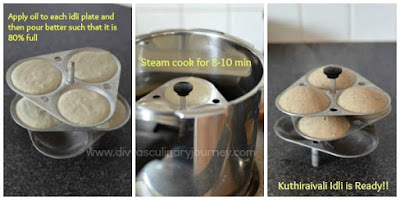 Then steam cook idli for about 10 - 12 minutes till it is done. Then let it cool for 3 -4 minutes then using spoon remove it from idli plate. Serve it warm with side dish of your choice. 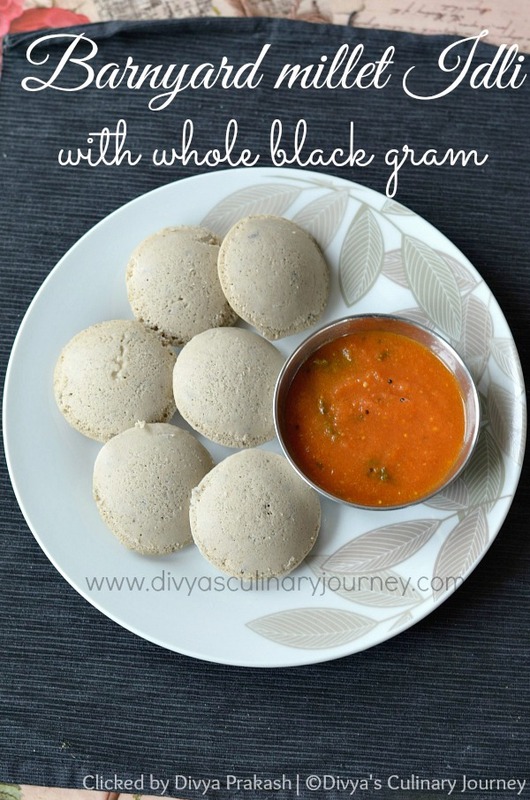 Learn how to make soft Idli using Kuthiraivali rice and whole black gram. It is healthy and delicious. Yield : about 25- 30 idlis. Soak Kuthiraivali rice and Black Urad dal with methi seeds separately for atleast 3 - 4 hours. First grind soaked urad dal along with methi seeds till it is smooth and fluffy. It takes 30 minutes. Transfer it to a container. 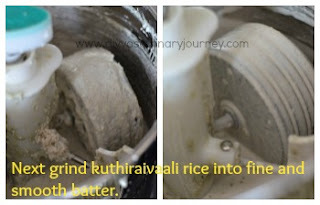 Then grind kuthiraivali rice till it is smooth.This will take another 30 minutes. 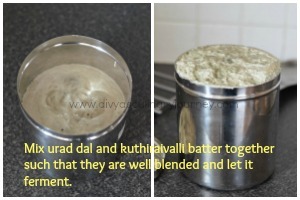 Add the kuthiraivali batter to urad dal batter, add salt and using hands mix the batter well. The batter will ferment and almost double in quantity. So the container should be big enough to accommodate it. Place the container with batter in a warm place to allow it to ferment. It will take about 12 hours. On warm days, fermentation will be faster while on cold days fermentation will delay. Once fermented, the batter is ready for preparing idlis. 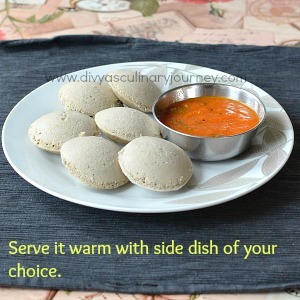 You can prepare idli immediately or refrigerate them for later use. Prepare idli plates by applying oil. Then pour a ladle of batter into the plate such that it is 80% full and steam cook for about 10-12 minutes. Let it cool for few minutes. Then remove using a spoon / knife and serve it warm with side dish of your choice. Instead of whole black gram, you can use regular urad dal too. But use the whole urad dal not the split one. While mixing the batter use your hands, which will aid in fermentation. Store the batter in warm place for better fermentation. The batter consistency is very important for soft idlis. If it is too thick then idli will be hard. If it is runny then idli will be flat. Once the batter is fermented, then without mixing take a laddle of batter from one corner of the container and use for fluffier idlis. The same batter can be used for making dosas. Dilute with little water and use it. Sooperb variation divya.. will definitely try it i use 2:1 ration.. tis seems better.. Thanks Kalpana. I usually use 4:1 for regular idli. But for this as I am using whole urad dal, I used 3:1. It worked well.